This topic came up a few days a go on HD trucks, thought I'd put together a quick ID guide for both LD and HD trucks, showing the visual differences through the years, as well as samples of the assorted models and differences from LD to HD. 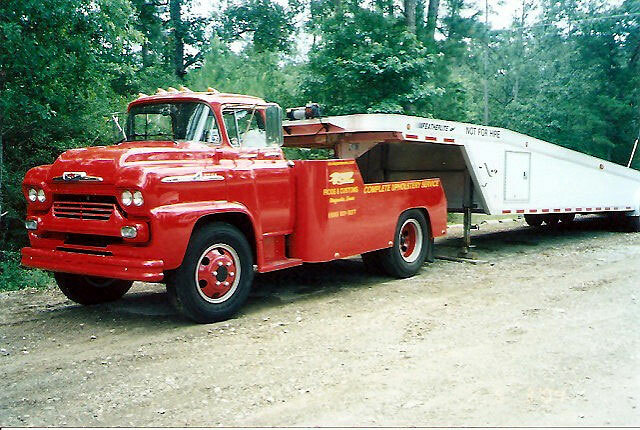 Here's a good example of the typical '55 light duty truck, a 3100 1/2 ton. Note that the hood and fender badges, as well as the door handles are chrome, even though it is a base model truck. I only mention this as I have seen a few builds with those parts incorrectly painted when they are chrome regardless of trim package. This one is a little higher trim truck, with both the chrome grille and chrome bumper options, plus the Full View cab. All 3 were separate options, and the Full View window does not necessarily make it a "Deluxe Cab" truck, as that was another separate option. 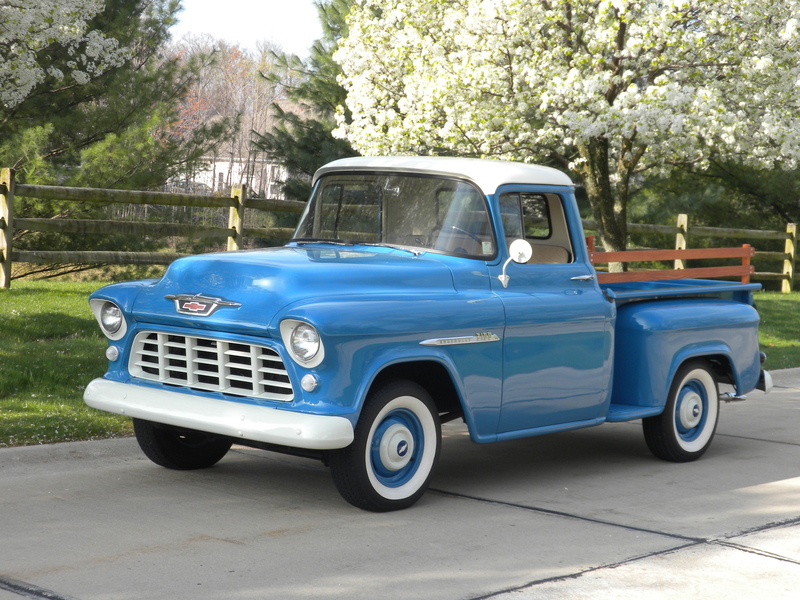 This particular truck is also a model 3204 longbed 1/2 ton, a new model for 1955. It's a combination of 1/2 ton (axles, brakes, wheels) and 3/4 ton (frame, bed, brake hydraulics, rear springs) parts. My own personal truck, which is also a 3204. 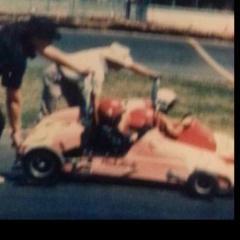 The Cameo Carrier 3124. 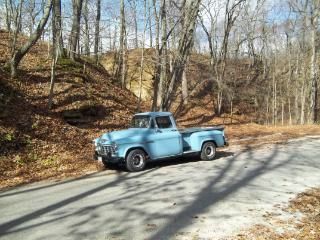 Another new for 1955 model, this truck has flush fiberglass bedsides in place of the standard fenders, plus many other parts specific to this model. All other options were available on these, and many were fully loaded. Bombay Ivory/Commercial Red 2 tone was the only option, and it is the only '55 that has an interior in colors other than the standard beige/brown/black combo. Note that this truck is a V8, and also has the very rare (though it has ben reproduced) hood bird ornament. Model 6400 2 ton. The 4000 series 1 1/2 ton is visually identical. Note the badge on the fender. The '55 HD trucks did not use the spear badge the lighter trucks used, they only have the model number. The grille, while it does look great in chrome, was never offered as such. It only came in white, or could be ordered in body color. Most of the LD truck options, including the chrome package (except grille and bumper), Deluxe cab, and full view cab, could be ordered on the HD trucks. 5400 Low Cab Forward. 2 ton rated, but could be ordered as a "Special" with 1 1/2 ton running gear. These were also new for 1955, taking the place of the cabover trucks. 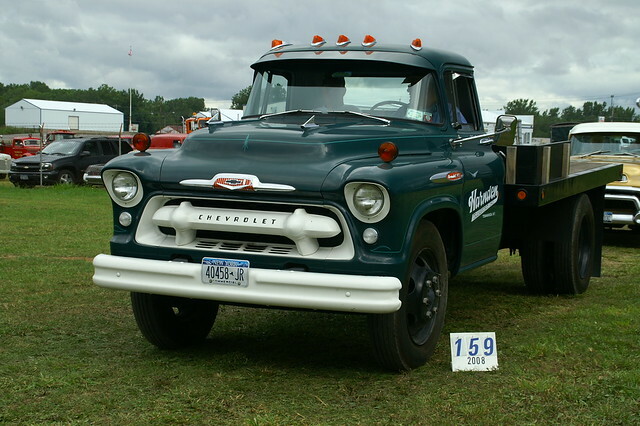 There were no Chevrolet cabover trucks bad through the Task Force era. 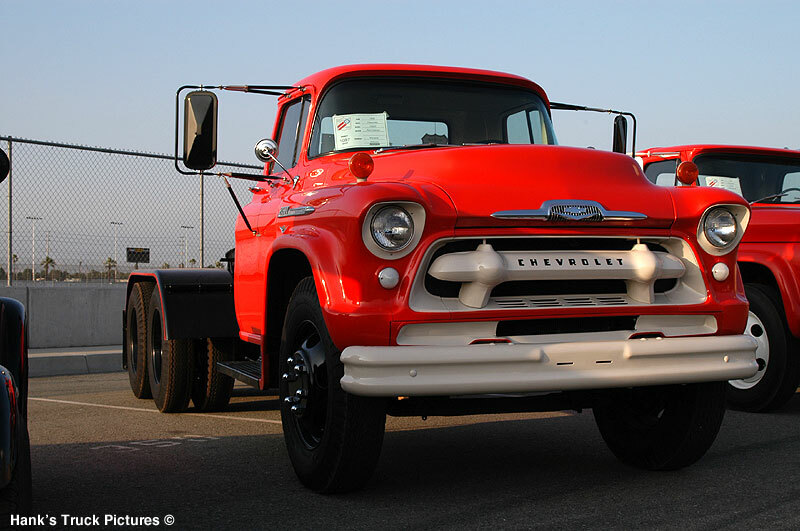 Also, the 5000 series trucks were the only trucks from '55 with the V8 engine as standard equipment. Just a note, I know I put "delete" a little bit ago, but I retract that as I have got the picture thing down. Next post, the '56 model year. Now for the '56. The '56 really didn't see much in the line of changes beyond a few mechanical improvement, new paint colors, and a few trim changes. The big mechanical changes include a new head for the 235 6 cylinder (the famed "848" head), plus the V8 gained a full flow oil filter (the '55 did not have an oil filter standard, the only year that lacks that feature). Other new mechanical changes include the new Powermatic transmission in HD models, plus a new 2 1/2 ton model in both single and tandem axle, as well as Conventional (8000 and 10000) and LCF (7000 and 9000) cab configurations. There was also a new engine for the 2 1/2 ton models, the Loadmaster V8, which is a 322 cid engine sourced from Buick. Also, as with 1955, all LCF trucks, the 5000 plus the new for '56 2 1/2 ton models (7000, 8000, 9000, and 10000) were the only models with a V8 as standard equipment. Cosmetically, the '56 has a few easily overlooked changes, as much of the look stayed the same. The grille has no change at all, but the hood ornament is inverted in shape. The indent, which is the same color scheme, curves around the bottom of the emblem. It also has ribbed pattern instead of checkerboard. V8 models also incorporate a "V" just under the Bowtie. The other major trim change is the fender badge, which is still the same basic shape, but is now mounted above the fender crease. The emblem is not the same as the '55, and they do not interchange, as they are shaped different on the back side. The '56 emblem is also 2 piece, with the split being just before the model designation number. They did that so that the forward part can be used on all models, and only the rear piece needs to be specific. The area around the Chevrolet lettering is also now black, instead of white on the '55. Inside, there were some new interior options, a Charcoal/Black, 2 tone green, and 2 tone blue. Some trucks also have a '56 specific horn button, the jury is still out as to which is actually "correct" as both the '55 button (which dates back to the '54) and the "56" button have been found on known unrestored trucks, as well as spotted in factory literature. One theory is that it might be tied in with the dual horn option. '56 3200 with the chrome package, chrome bumpers, and door handle scratch shields. Note the differences in the emblems. Cameo, fully loaded truck. Note the "V" on the hood emblem. 6400 this truck also has an aftermarket 4x4 system, most likely a NAPCO or Coleman. Close up of the '56 badge, showing the split. This is the lubrication chart from the '56 manual supplement for the Tandem Axle truck. They used an "over the shoulder" drive system, each axle has its own driveshaft. 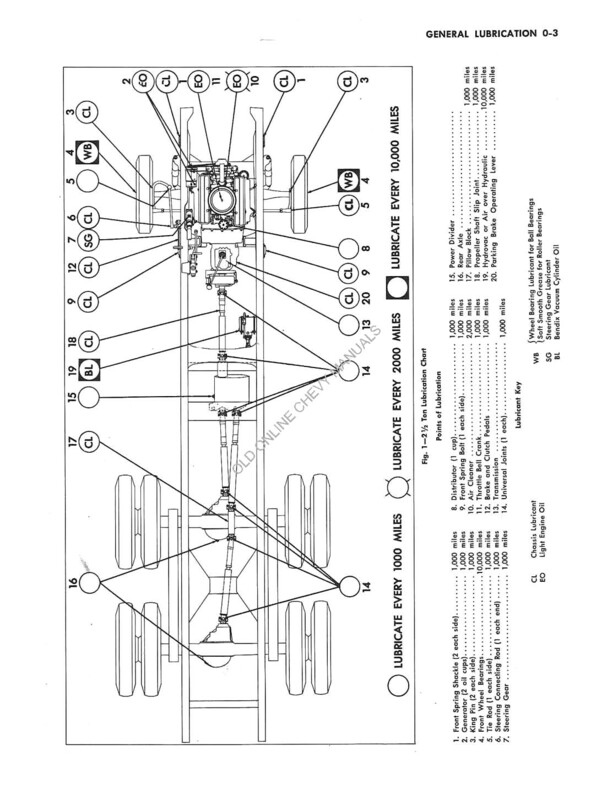 The rear axle is normally not driven, and is only engaged when the power divider, a combination transfer case and 3 speed transmission, is put into the "puller" gear, or if the decluthing lever is engaged in any gear. There is no center differential between the axles. 1957 brought several changes to the Task Force lineup, a few minor mechanical improvements, a new engine for HD models, new grille and badging, new hood, new steering column and wheel, plus 2 mid year changes; long bed 1/2 and 3/4 ton trucks got a 6" longer bed, and the addition of a factory installed 4x4 system on light trucks. Externally, not much changed with the sheetmetal, other than a new hood and 2 extra tabs in the grille opening on LD models for the new grille, which is now a double inverted trapezoid with 4 connecting bars above and below holding the center "floating" grille section in place. The hood emblem was the same as '56, with the color scheme reversed. The hood itself is also all new, with the addition of 2 bulges that mimic the similar feature on the Passenger cars. Unlike the Passenger car hood, the Truck hood does not have any standard trim. There were optional "gunsight" ornaments, though. The fender badges are now an elongated spearhead shape, with an offset oval at the rear of the emblem with the Chevrolet name in script and the model number. The oval is filled with red paint. It is not uncommon to see them mounted backwards, even a few got out of the factory that way. Inside, the steering columns are 4" shorter due to the requirement of dished steering wheels for safety. There were also new hubcaps for '57, which were used up to '60. Mechanically, not too much changed other than improvements on the engines. The 2 ton and larger trucks did get a variant of the Passenger 283, smaller trucks would not get this engine until '58. Also new, starting mid year, was the availability of a factory installed 4x4 system on LD models, which GMC had gotten the year before. The system was not designed by GM, but rather was sourced from NAPCO, who was a factory authorized aftermarket upfitter. The NAPCO 4x4 system had been available on GM trucks as a dealer installed option t least as early as 1952 (some source say 1949). The 4x4 system could be ordered on 3100, 3600, and 3800 (1/2, 3/4, and 1 ton, respectively) models, and were only available with the base 6 cylinder, 4 speed transmission, and single wheels on the 3/4 and 1 tons. It was not available on the 3200 or Cameo. Here's a very high optioned '57, with V8, Hydramatic ('57 is the only year with the Hydramatic badge), Full View window, Chrome package, Chrome bumpers, Deluxe Cab, hood sights, and rare factory spotlight. Here's an oddity. Factory 4x4 3/4 ton, equipped with an aftermarket crew cab body. 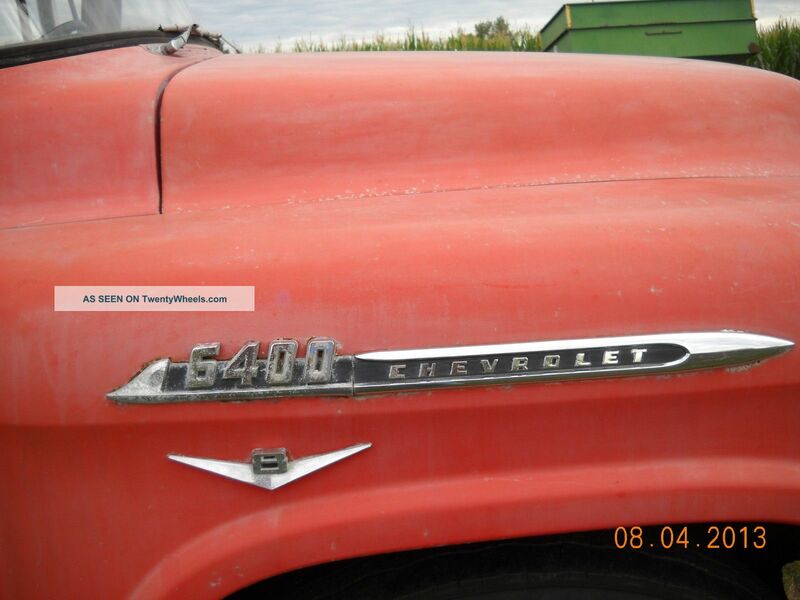 Chevrolet did not make a factory crew cab until 1973, but there were several aftermarket companies that did make them. Most were sold to logging companies and railroads. Another 4x4, this one is a NAPCO conversion, which was still available even after GM made it a factory option. Note this truck is a V8. Since you ordered the truck separate from the NAPCO conversion, a V8 truck could be ordered and upfitted. Cameo. In addition to the regular line changes, the Cameo also got new trim added for the bedsides, as well as it own fender badge that reads "3124". '57 is the only year that the Cameo has its full model number on its identification badge. 6400. HD trucks have the same appearance changes as their LD brothers, except for the grille which did not change. 1958 saw some major changes in the Task Force line. All new front end sheetmetal, 3 new models in the LD line, new engines for both the LD and HD lines, plus new model names for the trucks, one of which was synonymous with "Chevy Truck" for many years, and even is used by some as the model name for all years of Task Force. 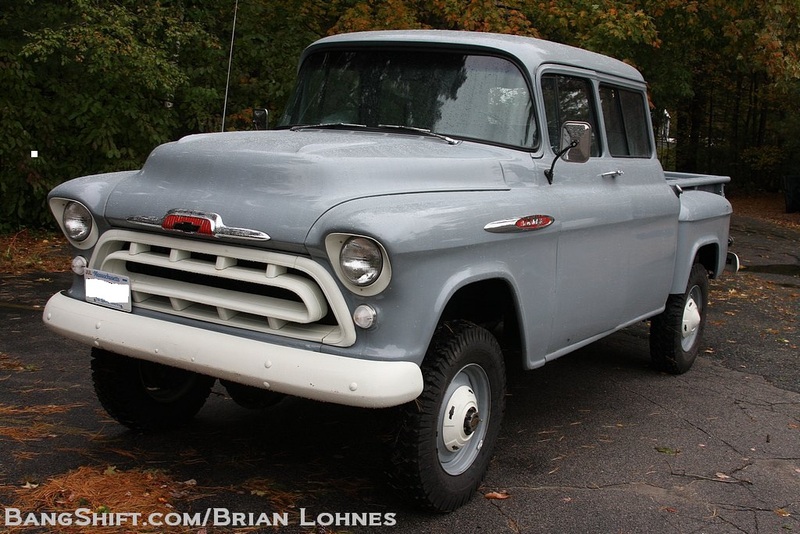 Sheetmetal changes were drastic for '58, quad headlamps, new grill, new hood and fenders. The fenders, while similar in shape, are actually wider than the earlier single headlamp trucks to accommodate the dual lamps. They also had some extra sculpting at the front of the fender opening leading into the new much wider grille. The fenders are also 2" longer that the earlier truck, requiring the frame to be 2" longer as well. The new grill is a wide, inverted T shape, with integral parking/signal lamps, and the Chevrolet name spelled out in block letter between the lamps. The hood is narrower, and now has a deeply sculpted recess in the center. The hinges are now attached to the inner fender instead of the cab. The hood badge, at first glance, looks similar to the '56/'57, but the center recess now goes over the top of the badge instead of below. Fender badges are all new as well, with a "jet" theme. The badges also only call out the first 2 numbers of the model, ex. 31 for a 1/2 ton. The Cameo is still available at the beginning to the year, but is phased out by midyear and replaced with the new for '58 Fleetside. '58 is the lowest production year for the Cameo, and among collectors, the least desirable. The new Fleetside is available in both the short and long 1/2 tons, as well as 3/4 ton, and in a 4x4 version for the short 1/2 and 3/4 tons (4x4 was not offered on the long 1/2 ton). New model names are also introduced, Apache for 1/2 through 1 ton, Viking for 1 1/2 ton and 2 ton, and Spartan for the 2 1/2 ton. 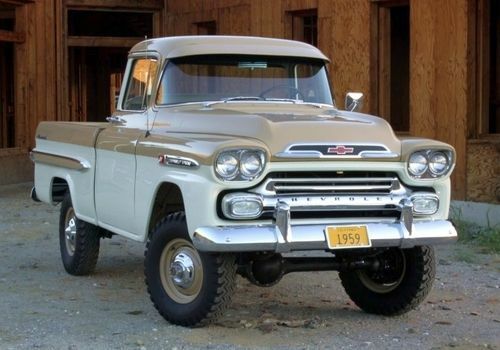 The Apache name, which Chevrolet used on light trucks through '62, is associated enough with the Task Force body that even if folks ar looking at a '55, they will invariably ask if it's an "A[ache". I've actually had that happen to me at shows. Mechanically, the 283 is now available in all models, and the new for '58 348 is available on HD models. The Loadmaster 322 is also still available, though mostly relegated to bare chassis and School Bus models, as the 348 replaces it in most other applications. The new for '58 Fleetside, model 3134 1/2 ton. 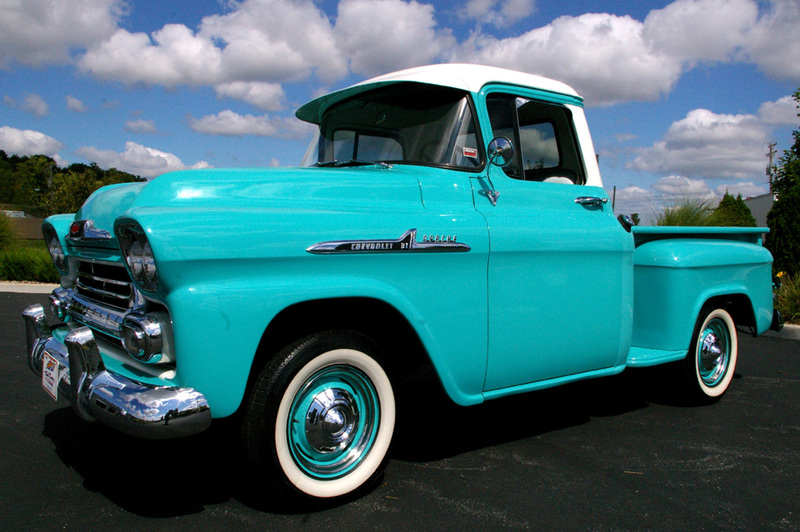 This particular truck also has the extremely rare for '58 bedside trim. Very few '58s got this, most believe it to be a '59 only option, though some possibly late production '58s got it. 1959, last year for the Task Force, saw little in change other than trim. A new hood ornament and fender badge, plus a few new colors was pretty much it. The big news for '59 trucks was the addition of the El Camino. The main appearance changes were in the badging. The new hood ornament was a very wide rectangular shaped part, with a thick lower bar and a thin bar surrounding a black field with a red Bowtie in the center. V8 trucks also incorporated a "V" in the badge. The fender badges are now rocket shaped, and mount at the front of the fender. The model number, again in a 2 digit form like '58, is at the rear of the badge. There is also a very minimal change in the grille, the lower bar is slightly thinner than '58. Mechanically, there are virtually no major changes, other than a revised cam profile for the 235 for improved fuel efficiency. The major new mechanical option is the new for '59 (in trucks) Positraction option for 1/2 ton models. The new Positraction axle was a completely different unit than the standard Eaton sourced axle used in 1/2 ton. The axle itself is a Spicer 45, which was more commonly found in the GMC truck. It is a heavy duty variant of the Spicer 44, though few interchange with it. That axle is a somewhat rare part, and is often replaced with a standard Eaton axle in restorations due to lack of parts availability, bearings, brake drums, and parking brake cables, which are all specific to that axle, are not available anymore. I'm not going to go into the El Camino, as it is more of a Passenger car, and really doesn't fit into the information I'm posting. Fleetside, rear view. Note the bumper. The rear bumper on Fleetsides is not the same as the Stepside or Panel/Suburban. It is flat, no curve like the Stepside. The Panel/Suburban have their own unique bumper, which is a modified variant of the front bumper. 3100 4x4. This truck is also equipped with the special Anniversary paint scheme. Location:Sittin' in Belgium, Dreaming of Hawaii.. Thanks for the info!!!! Really learned from it. No problem. If you need to know anything about a specific model, don't be afraid to ask. Useful, thanks for posting. Now I can tell the difference between '55/'56, and between '58/'59. Check page 147 on that last link. Excellent information, thanks for sharing! The big window option, called the "Full View Cab", is intended to eliminate the blind spot at the rear. 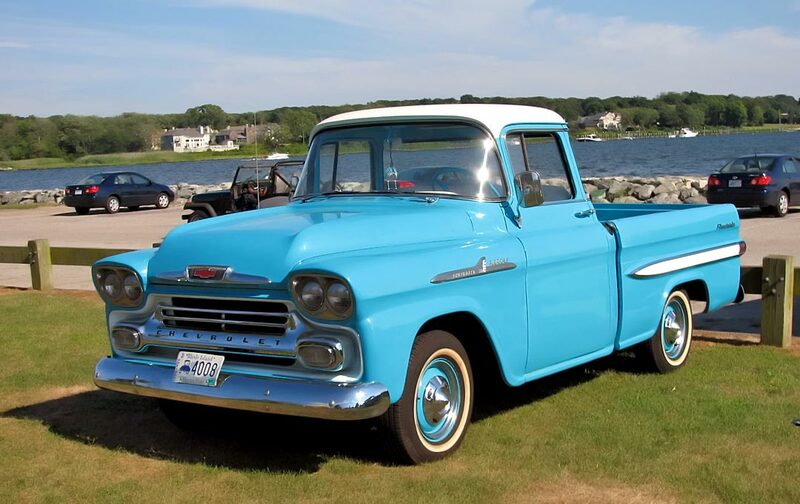 The 5 window option on the '47-'55.1 trucks served the same purpose. Since it was an extra cost option, it wasn't very common. The only model that had it as standard equipment was the Cameo. Contrary to popular belief, it is not part of the Deluxe Cab option, though most trucks with the big window also have the Deluxe Cab option. The big window option carried over to the '60-'66 and '67-72 body as well, though after '67, it is very rare to see it on pickups. I m looking for a 58 or 59 Chevy Spartan (Would prefer the Spartan 100, not 60 or 80, but will look at anything). I don't care about condition or even if the chassis is shot. It could be a fire truck or dump truck....literally anything....Please PM me. 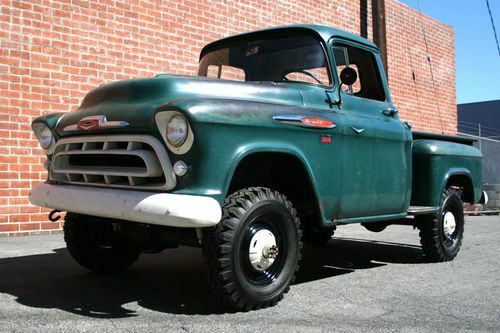 Someone told me the 59 Apache cab is exactly the same as a 59 Spartan cab and the only difference is the fenders, hood, and grill anyone know if that's truthful? Thanks for any help! Truly appreciated! That's a nice looking fire service truck there, Casey. I'm going to guess that "Apache" is Chevrolet's 4x4 designation? According to what I read online (so you KNOW it's 100% true ) it's the name Chevrolet used for their light duty trucks, while Viking was used for heavy duty models. I'm sure Bill B. or someone else/ would know for sure. 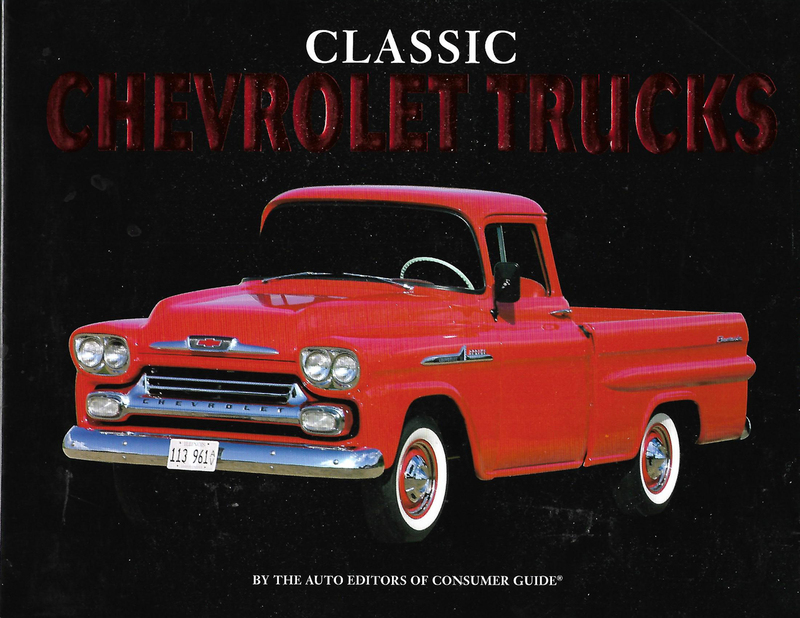 From the Book of Knowledge, it was 1958 they introduced Apache for the light trucks, Viking for the medium duty, and Spartan for the heavy duty. I don't know when they stopped using those names, sometime in the 60s? I think I've seen early 60s pickups w/ Apache badging.. I own a 1959 chevrolet spartan 100 with the 132 inch wheel base that has the big window. I think it is a deluxe cab, how can i tell for sure? everyone says the never made that truck but i think i have it, I'm just looking for opinions from some of ya'll that know alot more than me. I can send pictures of the truck and am open to listen to anybody that might have information on this. The The 1947 - 1959 Chevrolet & GMC Pickups Message Board is a goldmine of information. It has saved me much grief when working on my previous '69 and current '68 pickups. I'm also 89AKurt on there. 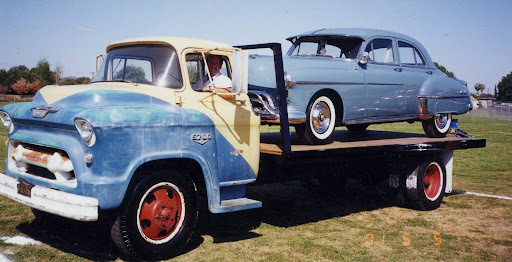 When I was looking for my first antique pickup (late 90s), looked at a '55 Cameo that was white, but because it had the cheap fiberglass bed sides and there was a big hole in it, I declined buying it. Got a rolling wreck '48 5 window instead. When I was buying parts from someone near me, saw that truck parked among their collection, they were thrilled to have found it, all original and really good shape and the price was really good too! I was sick, but I didn't know anything about these trucks then. Thanks for the link, I scanned through it at work and think i will be able to get alot of info from it when i get home. I appreciate you taking the time.